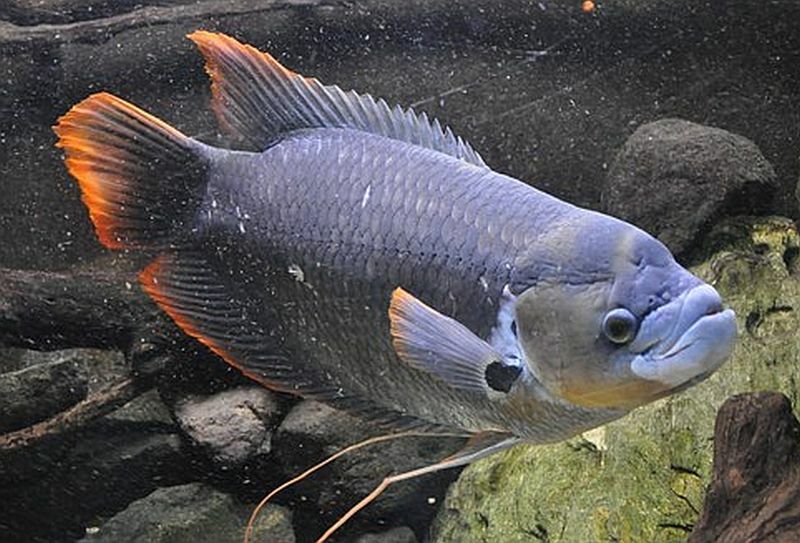 Tag Archive | "Giant Red Tail Gourami"
Giant Red Tail Gourami (Osphronemus laticlavius) are also known to tropical fish keeping enthusiasts as Giant Red Finned Gourami, Red Flag Giant Gourami, Giant Red Fin Goramy, and Red Tail Gourami and are found in Indonesia and Malaysia. 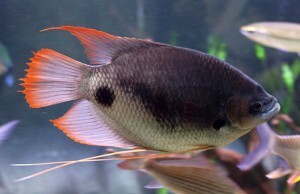 Giant Red Tail Gourami are rare in the aquarium hobby and have only been known to science since the early 1990s. Like Giant Gourami, Osphronemus laticlavius are found in the heavily vegetated stagnant waters of swamps, marshlands, and sluggish moving canals. 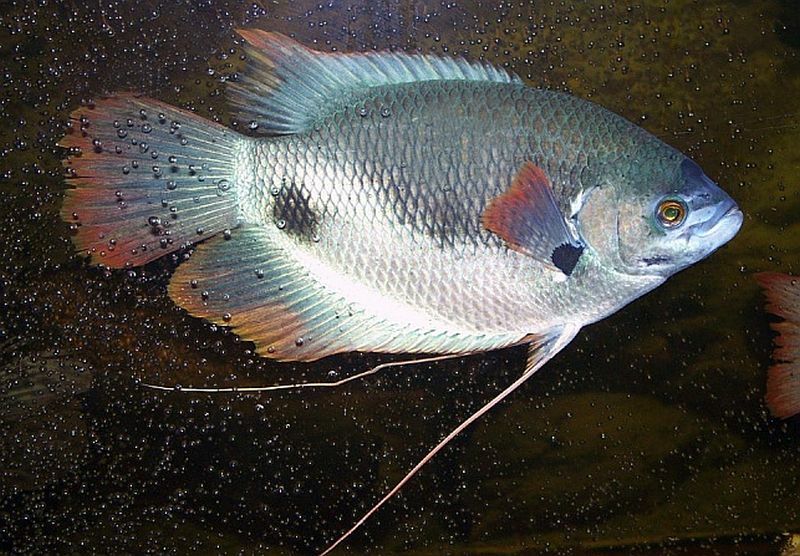 They are also found in slow moving rivers, lakes, and flooded forests during the rainy seasons and like other gourami, they posses a special labyrinth organ that enables them to survive in oxygen depleted waters. Giant Red Tail Gourami have a laterally compressed, deep, oval shaped body, and a blunt head. Juveniles have a steely blue gray to black body color that develops beautiful blue green highlights as the fish mature. Adults have a blue green to almost black body color and fins that are trimmed in bright red, with filamentous extensions and a “nuchal” hump on their forehead. The females usually have thicker lips. Giant Red Tail Gourami make great pets. Like Giant Gourami, they are able to recognize their owners and over time can develop real personalities. Giant Red Tail Gourami are generally peaceful, but there can be exceptions to this rule, especially when they are housed in a small aquarium. In rare instances a large male will become territorial and attack other fish, but in a properly sized tank, they are generally a good community fish with other larger species like knife fish, large catfish and loricariid. When juveniles have been raised together with smaller barbs, tetras, danios, etc. they don’t consider their tankmates dinner and usually ignore them. However, as they grow into adults, they “own” the tank and any new additions, regardless of size, will likely be killed. and pieces of driftwood for them to hide among, some floating plants , and plenty of free swimming space. This species is a voracious herbivore so it is not advisable to plant slow growing aquatic vegetation in their tank. Despite the fact that they can breathe atmospheric air and can tolerate a variety of water parameters, they need a good filtration system, some water movement, and clean water to thrive. The use of a canister filter and weekly 20-30% water changes are highly recommended. In their natural habitat, male Giant Red Tail Gourami build ball shaped bubble nests approximately 16″ W. by 12″ D. out of bits of vegetable matter from 6″ to10″ below the surface of the water, and anchor it to the reeds or to subsurface grass. The male takes about a week to 10 days to construct the nest (usually during April and May) at which time the spawning takes place. Between 1,500 and 3,000 eggs are fertilized and released into the nest. Both the eggs and the fry (when hatched) are lighter than water and will float to the top of the bubble nest. The male will gather them into his mouth and place them into the nest where they are guarded until they hatch. In approximately 40 hours the eggs hatch, and 15 days later the fry will be free swimming. or newly hatched baby brine shrimp. Giant Red Tail Gourami are opportunistic feeders and in their natural habitat will consume copious amounts of vegetable and animal matter. Their natural diet consists of aquatic weedy vegetation, small fish, frogs, earthworms, crustaceans, and sometimes even carrion. In an aquarium environment, they should be fed a balanced diet heavy on vegetable matter. Besides omnivore flakes and pellets, they will eagerly accept live, frozen or freeze dried brine shrimp, worms, fish, bloodworms, algae wafers, lettuce, boiled potatoes, peas, cooked foods, etc. Beef heart and meat from mammals should be only fed sparingly. They are not picky eaters and will eat almost any aquarium food if trained to do so as juveniles. Feed them once or twice daily. Although the demand from tropical fish keeping enthusiasts for this species is high and the fish are quite pricey, Giant Red Tail Gourami are only occasionally available for purchase online.